The acai berry is a powerful superfood that is packed with antioxidants, vitamins, minerals, and other nutrients. It also has a wonderful flavor that makes an excellent addition to smoothies. Some describe the taste of the berry as bitter, but with a little added natural sweetener, you can bring out the delicious flavor in this fruit. Try buying the frozen pulp of the acai. In the pulp form, it is easy to add this superfood to your next smoothie. Although often called a berry, acai really isn’t one in the traditional sense. In technical, botanical terms, acai is a drupe. This means the seed is in the center of the fruit, just like in a cherry or a peach. Acai fruits grow on the acai palm, which is a tree that is native to Central and South America. The acai palm is harvested for its fruits, but also for hearts of palm. Both the berries and the hearts of palm have long been an important source of sustenance for the native people of the Amazon region. When westerners first discovered the fruits of the acai palm and its many wonderful health benefits, some marketers of the juice and other products went a little too far. It was sold as a miracle weight loss supplement and anti-aging cure. Some even made the claim that the juice of the acai could cure cancer. Not only were these claims made with no or questionable evidence to back them up, marketers falsely claimed that celebrities like Oprah Winfrey and Rachel Ray were endorsing their products. Whatever you do, do not let the negative press keep you from using acai. Although many claims made over the last few years were over the top and false, acai berries are a genuine, nutritional superfood. They may not erase your wrinkles on the spot, cause you to lose ten pounds per week, or cure cancer, but acai berries are full of valuable antioxidants, healthy fats, protein, and important vitamins and minerals like B vitamins, vitamin E, calcium, and iron. The health benefits of acai berries come from their nutritional content. Frozen acai pulp is low in calories and contains healthy fats. It has no cholesterol and very little sodium. It contains a significant amount of fiber and protein, plus vitamins A, B, C, and E, calcium, iron, and a number of trace minerals and antioxidants. Here are some ways in which acai is good for you. Weight management: Acai may not be the miracle weight loss supplement as some manufacturers have claimed, but it can promote healthy weight loss and weight maintenance. This is because the berries are low in calories and high in fiber. They can help you feel full while also providing important nutrients. As part of a healthy diet and a regular exercise regimen, acai can help you keep a healthy weight. Antioxidants: Free radicals are those nasty little molecules that can cause damage to your DNA. This damage, as it accumulates, can create all kinds of problems, from premature aging to cancer. Antioxidants are compounds that destroy free radicals before they have the chance to harm you. Acai berries have more antioxidants than nearly all other foods with high levels of these helpful compounds, including red wine, blueberries, blackberries, and raspberries. The antioxidants found in acai fruits are called anthocyanins and flavonoids. Atherosclerosis: Atherosclerosis is the hardening of arteries that leads to heart disease. Acai has been shown to prevent this hardening through the anti-inflammatory properties in the fruit. According to research, the juice of acai seems to be able to inhibit cytokines, compounds that are involved in the development of atherosclerosis. Cholesterol: Research conducted with rats has shown that including acai in your diet can improve your cholesterol profile. Rats that were fed acai and a high fat diet ended up with improvements in their cholesterol profile. While the study was not conducted on humans, the results found in rats are promising and give you another reason to include acai in your diet. Cancer: Yet another promising study has shown that acai may help to kill cancer cells. In a cell culture made of leukemia cells, extract of acai destroyed up to 86 percent of the cells. It is important to understand that testing compounds for their anti-cancer properties in a culture as opposed to within the human body is a very early step in finding something that fights cancer. However, the results are very positive and more research will likely be conducted to find out the potential of acai in fighting cancer cells. Healthy fats: Acai berries have significant quantities of monounsaturated fats, especially oleic acid. These are healthful fats that can help to improve your cholesterol profile and decrease your risk of developing heart disease. These fats are also known to help regulate blood sugar levels and insulin. For people with type 2 diabetes, getting more monounsaturated fats is important. Oleic acid is also responsible for keeping your cell’s membranes supple. This allows your cells to absorb nutrients more efficiently. Protein: Acai berries contain a nearly complete protein profile. A complete protein is one that contains all of the amino acids, or building blocks of protein, that your body cannot manufacture on its own. Foods with a complete protein profile include meat, dairy, and soy. Acai has nearly all of the necessary amino acids and its protein profile is more complete than most fruits. What different forms of acai are available? Acai berries do not travel well, so you will not find the fresh fruit in your local health food store. Most commonly, you will find acai as a supplement, in pill form, as a powder, or as a juice. You can now also find acai as a frozen pulp both in health store and online. Which is the best form of acai? This may be a matter of opinion, but the best way to get the pure, unaltered fruit, is to buy the frozen acai pulp. Acai supplements and powders may provide some nutrients, but the whole food is always better and contains more nutrients as well as fiber. Juices may be an ok option, but beware the extra ingredients. Read the label carefully and choose a juice that has plenty of real acai and no added sugar. Also, raw juices retain more nutrients from the berry than pasteurized juices. The juices can also be very expensive. Can acai be used topically? Yes. You may notice acai as an ingredient in beauty products, specifically, acai oil. The reason manufacturers add it to their products is for the potent antioxidants. Studies do show that the amount of antioxidants in the berry is retained in the oil and that acai oil is safe to use on skin. Whether it really helps to reduce wrinkles is not known. Are there any side effects or dangers associated with eating acai? In general, acai is considered very safe to consume. Some people may be allergic to it. Try acai with care if you are allergic to pollens or palm products. If you have any concerns, or if you are pregnant or nursing, consult with your doctor before trying acai. The best way to use acai in your smoothies is to use the frozen pulp. This way, you get the whole fruit with all its nutrients and the fiber. Using the frozen fruit also helps you get a nice texture and consistency in your smoothie. It is similar to adding frozen berries. Also keep in mind that if you are using pure acai juice, the flavor is very strong. Acai tastes rice and fruity, but also a little bit like chocolate with hints of red wine. It goes well with berries, grapes, pears, coconut, and cacao. Have fun and experiment, but also try these recipes. Pomegranate is another richly flavorful fruit with a deep red color and plenty of antioxidants. Together with acai, this packs a powerful and healthful punch. Blend the following ingredients together until you get a nice consistency. 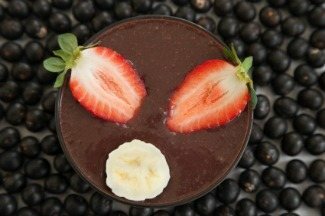 If you are in the mood for a rich, decadent dessert smoothie that still provides you with important nutrients, combine acai with coconut and chocolate. Make sure you use raw cacao for maximum nutrition. Blend together the ingredients until nice and smooth. For all of my smoothies featuring this wonderful superfood – acai smoothie recipes. I’d love to know if you use acai your smoothies and what health benefits you have experienced – please divulge in the comments below. Lately, I’ve been getting the frozen 3.5 ounce Sambazon organic pure acai smoothie packs from my co-op. Amafruits is another brand I like. Your local health food store or even grocery store should carry these or something comparable. I love Acai berry, but have only ever found it in supplement or juice form. I’d definitely be curious to try frozen Acai, I bet it would be amazing in smoothies! I think that coconut-chocolate recipe sounds like it would be right up my alley! Mmm! Thanks for the read and recipes! I think that we need to go to the scientific article to state this clear. Thanks for pointing out that mistake. You’re right, HDL is the good cholesterol and LDL the bad. This article was just updated. Hi your free ebook received thank you. I’m looking for weight gain recipes do you have a book for this?